My obsession with banana bread has grown almost as bad as my obsession with cinnamon. I decided that I didn’t just want to take in my banana bread by the slice — but also by the spoonful. This granola tastes just like banana bread with a crunchy, nutty, granola texture. It is packed with whole grains, fiber, and a serving of fruit. I also threw some hemp seeds in there for good measure. Hemp is considered one of the worlds most nutritious plants, and is known as the “most nutritionally complete food source in the world.” Who wouldn’t want to start their day with a seed containing a ton of antioxidants, magnesium, essential fatty acids, iron, potassium, fiber and all of the essential amino acids? What really takes this wholesome granola (which doesn’t taste wholesome at all) to the next level is coconut oil. If you absolutely cannot get your hands on coconut oil, you can substitute an equal amount of melted butter and the recipe will work. But coconut oil is absolutely mouthwatering in this granola, giving it a sweet, rich flavor. It also has many health benefits ranging from stress relief to bone strength. 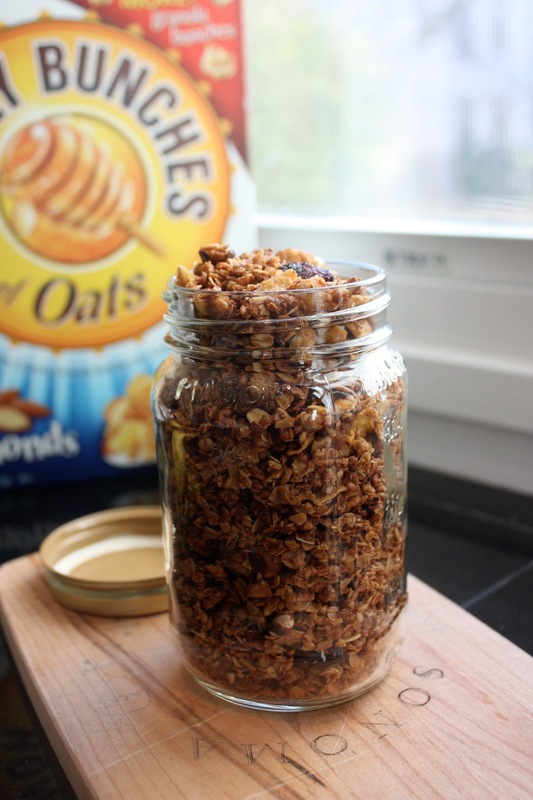 When I drench this granola with milk, it infuses it with a sweet, warm, cinnamon flavor. Sinfully delicious, outrageously wholesome. Now that’s how I like to do breakfast. Mix all of the wet ingredients and bananas in a stand mixer. Add oats and let the machine run for a few minutes. Add hemp seeds. Scrape the sides until nice and clumpy. Add walnuts. Spread granola onto a baking sheet lined with parchment paper. Bake for 25-30 minutes, spreading and turning with a wooden spoon ever so often to make sure everything browns nice and evenly. Let cool, then stir in banana chips and chocolate. Yes, I’ve been going crazy for carrots lately — carrot Lara bars, carrot pancakes, some carrot muffins and a big moist carrot cake slathered with cream cheese frosting. I can say that my dad’s 5 pound bag of carrots was a blessing in disguise, as it left us with a ton of carrot flavored treats. This granola captures the essence of carrot cake perfectly — full of rich toasty coconut flakes, big buttery pecan pieces, and chewy, sweet raisins . In fact, I wouldn’t be surprised if my neighbors thought I had a big ol’ carrot cake baking in the oven. It looks like regular old granola, but its a mouthful of crunchy carrot cake in every bite! Some mornings I wake up and think “Man, all I want today is a big bowl of cake for breakfast” — I’m sure some of you can sympathize. When I pour some cold milk on a big bowl of this granola, the clusters soften ever-so-slightly and the milk resembles cream cheese frosting. Full of rich coconut flakes, big buttery pecan pieces. So yes, I am proud to say I am a borderline hippie who loves to make her own granola. Do you have any funky granola flavor ideas for me to try? I am up for a challenge! In a large bowl, combine both oats, honey puffs, cinnamon, allspice, cloves and ginger. In a separate bowl, combine the apple sauce, honey, brown sugar, agave, canola oil, vanilla extract and carrots. With a silicone spatula (or any other flat tool), push down the granola to make a compact, flat and even layer of granola. With a large spatula flip over the granola, cut the larger clumps in half and add the nuts and coconut to the baking sheet. Store in airtight containers and enjoy!